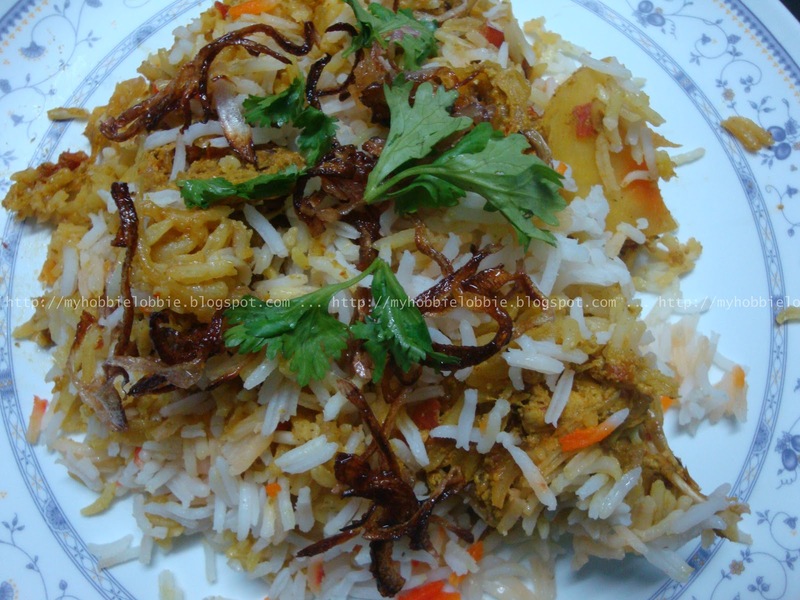 The Aspiring Home Cook: My 100th Blog Post & The Best Chicken Biryani Ever !!! My 100th Blog Post & The Best Chicken Biryani Ever !!! I can't believe it but here it is, my 100th blog post. I'm so excited. I know for most folks its just a number, but it means a lot to me. There have been a few times where things were so chaotic, I thought I would not be able to continue blogging. But this blog has been such a wonderful journey so far, I couldn't stay away for long. I've met so many wonderful and talented people in the last few months, I've made quite a few things on my "to try" list (which by the way is growing at a crazy rate with each passing day :-o) ) and received so much love through the comments left here, its touching and has very often made my day. I wouldn't give this up easily. I'd like to take a moment to say Thank You to each and every one of you who is following my blog, everyone who takes the time to comment on my posts and every single one who visits the blog. I love hearing from everyone, so I'd love if you could keep the love coming!!! To mark this occasion, I'm going to share with you a treat I whipped up for my husband over the weekend. He loves Moghlai food, specially Biryani and kebabs. Me, I'll eat it but am not to crazy about it. I have made a mutton biryani in the past, but it was nothing you'd write home about. Anyway, I wanted to make something special for my special man, so over the weekend I decided to try out a different recipe and this time make a Chicken Biryani. When I googled it, I came across a doozy of a recipe over at "Flavors of Mumbai" and decided to try it out. Be warned, this takes some amount of time, so please don't make it in a hurry. The flavors are much much better if you use slow cooking. After a couple of hours, what I had was the most amazing Chicken Biryani I have ever eaten. I actually enjoyed it and I know I will make this again. This recipe is definitely a keeper. It not only tasted great, it looked fabulous, just how it looks if you order it in a restaurant, with a few colored grains of rice, garnished with some caramelized onions and all. Marinade the prepped chicken pieces with the marinade mix and keep aside for about an hour, during which other elements of this dish can be put together. In a large vessel, bring some water to a boil with 1 bay leaf, 2" cinnamon, 3 green cardamom pods, 1 mace, 4 cloves, 5-6 black pepper corns. (Please taken sufficient water to boil the rice - to give you an idea its about the same ratio in which you boil water to cook pasta). When the water comes to a boil, add the rice, let it come to a boil, add salt to taste and cook till it is half done. Remember you only need to par boil the rice, because there is a fair amount of cooking it will still need to go through. Drain the water completely and keep the rice aside. Chop a few coriander leaves and keep aside. Heat some ghee (clarified butter) / oil in a pan and fry the sliced onion on a low flame till the onions have browned and become crispy. (A low flame will caramelize the onion while using a higher flame will simply burn it and make it bitter). Keep this aside. Grind the mint leaves, fresh coriander and green chillies in a blender, using a little water to aid the process. Keep this mix aside. Heat the ghee in a large vessel. Add 3 bay leaves, shahi jeera, the rest of cloves, black peppercorns, cinnamon and green cardamom pods. After a couple of minutes, add the sliced onion and fry it off on a low flame till the onions have reached a softened, brown stage which means they are caramelized. Add the ginger garlic paste and stir well. Cook it for a few minutes. Add the green mix, made above and stir well. Let this cook for another minute or so. Now add the coriander powder, biryani masala, turmeric powder and red chilly powder. Stir well. Let it cook for a couple of minutes. Add the chopped tomatoes and stir well. Sauté the mix for 2 minutes. Add the yogurt and stir well, till everything is well combined. Cook for a couple of minutes. Add the cubed potatoes. Stir well and let this cook off for a minute or two. Check for seasoning and if needed add some salt, to taste. Stir well and let it cook for about a minute. Take it off the gas. To arrange the layers for the biryani, take another large vessel. Place half the chicken gravy at the bottom of the vessel, forming the fist layer. Gently spread half the par boiled rice over it. Place a few dots of ghee and sprinkle half of the saffron infused milk. If you are using food color, add a few random drops here and there. You just want a few specks of colors rice. Layer the rest of the chicken gravy over this. Top with the rest of the rice, dotting with a little ghee, the rest of the saffron infused milk and food coloring. Place a large heavy bottomed pan / tava / griddle on a low flame. Place the vessel with the layered biryani on it. Cover with a lid. To cook it dum style, you could seal the edges with some dough, or place the pestle of the grinding stone or any other heavy, fire proof object on the lid. Let this cook on a low flame for about 30-40 minutes. Garnish with the caramelized onion and some chopped coriander leaves. Congrats on you 100th Post .... I am glad you selected recipe from my blog for your 100th post. God bless you and all the best for your blog. mmm....yummy! You did the right judjement to your blog's 100th post by posting nothing less than the popular Chicken Biryani! Yummy-looking photo. And congratulations, great going indeed!! Thank you Ammu, Maria, Purabi and Juliana! Congratulations and wish you and your Blog a long and happy presence in the culinary world!! Congrats on ur 100th post!!! And the biryani looks authentic & delectable!! It definitely sounds like a keeper! Your husband must have been thrilled. I'm so excited to try this recipe Trisha! Congratulations on your 100th blog post. And not just that, but 100 really quality, well-written and expertly conceived posts. Not everyone that blogs can claim that distinction, but you, my talented friend, CAN! Thank you for your kind words Jenn, it means a lot to me!!! i've only ever made briyani once before and it was so complicated...i love your recipe..it looks gorgeous and do-able! thank you for sharing with tuesday night supper club!